MACON, Ga. — We’re taking a dive into just how deep the talent goes at 13WMAZ. 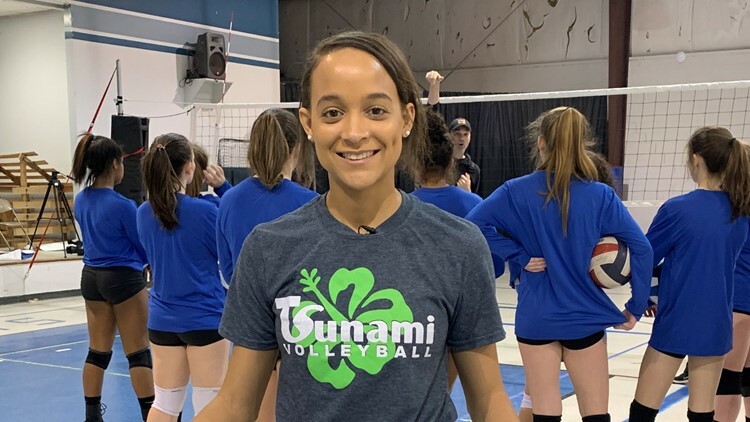 This week, we take you inside the gym with 13WMAZ reporter Pepper Baker where she coaches volleyball. Q: A timeline of your own volleyball career? A: When I was in 6th grade, I tried out for the middle school team, and I actually didn't make it. It crushed me, but I was determined. So, I ended up joining the city league team. So, then I tried out again my 7th grade year; and I made it, and I was just so happy. I started playing volleyball year-round in 7th grade. Then, 9th grade I played JV, and finally made the varsity team my 10th grade year, and that was a big deal. We won the state championship when I was in 11th grade. That was just awesome; it was a very hardworking year. Then, I played in college. I decided to go up to the University of Massachusetts in Boston. We made it to the Elite 8 my freshmen year. That was an incredible experience. Q: What age group do you coach and how did you adjust to the transition from player to coach? A: The age group I coach here is 15-year-olds, so they're all in 9th grade. They all go to different schools. A couple of them are in Macon, but most of them are in the Houston County area. My high school coach and I are still really close. I went to Leon High School in Tallahassee, Florida. When I would come home from college, I would always help her during pre-season. So, it was natural for me. I never had my own team, but I would come home during the summer and help her run workouts or weight room, and she would have the girls go up to the gym and do practice and I would be one of her assistants. I was always a player that had to learn how to play volleyball very smart. I'm not tall by any means, but I can jump high. So, I always learned how to play the game from a different perspective. I listened to my coaches, and I always took in the different knowledge they had. I try to do that with my girls. The ones that aren't super tall or can't jump as high, I try to make them smart with the game and knowing how to place the ball and be tricky. So, it really wasn't a hard transition because as a player, I just looked up to my coaches so much, and I'm happy to be that person for these girls now. Q: Your favorite part of the coaching process? A: With my age group, you can see the most progress in a short amount of time. They're still kind of awkward, and kind of getting used to their body. So, it's really awesome to see from the start of the season to the end, and even honestly, just in one practice. When they listen to me, and I can see them making the conscious effort to change some weird movement with their body and it makes them better. Seeing their improvement in such a short amount of time is the most rewarding part of coaching. Pepper says it's awesome to be out in the Central Georgia community and make a difference in and outside of the newsroom. When Pepper Baker isn't in the newsroom, she spends some of her free time coaching high school volleyball.